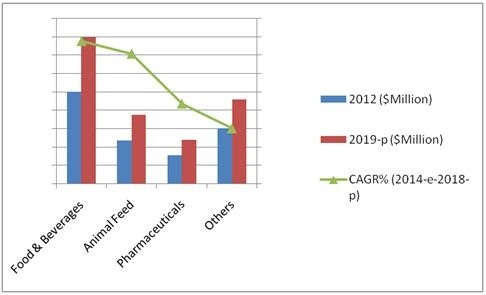 The new report “Carbohydrase Market by Applications (Food & Beverage, Animal Feed, Pharmaceuticals and Others), by Type (Amylases, Cellulases, and Others), Source (Microorganisms, Animals, and Plants), by Geography - Global Trends & Forecasts to 2019", by MarketsandMarkets, identifies the driving and restraining factors of the global Carbohydrase market with analysis of trends, opportunities, winning imperatives, and challenges. The market is segmented and values are forecasted on the basis of major regions such as North America, Europe, Asia-Pacific (APAC), and Rest of the World (ROW). Key countries are covered and forecasted for each region. Further, the market is segmented on the basis of application and type. Carbohydrases find a wide range of application in industrial processes and products, mainly in the food industry. With these enzymes, it is possible to obtain different types of sugar syrups (glucose, fructose, and inverted sugar syrups), prebiotics, and isomaltulose, which is an interesting sweetener substitute for sucrose to improve the sensory properties of juices and wines and to reduce lactose in milk. With the increasing demand for quality, carbohydrases are seen as natural and innovative solutions in today’s industries. The usage of carbohydrases as processing aids and ingredients in industries is the key differentiation factor for industrial users and also act as a great source of product innovation and differentiation. The market for carbohydrase is expected to experience a growth of 6.6% from 2014 to 2019. The estimation is a result of regular research and developments in the industry, along with widening application of carbohydrases. The two major types of carbohydrases, amylases and cellulases, are mainly involved in the catalytic hydrolysis of starch into sugars and catalyze cellulolysis, respectively. The carbohydrase market is driven by various factors including the emerging new applications, growing demand in the Asia-Pacific region, technological advances in enzyme engineering, and rapid growth in the pharmaceutical industry. The application of carbohydrases faces challenges while responding to the changing temperatures and pH. However, the effects of the market drivers outweigh those of the restraints, and hence the market is anticipated to experience healthy growth in the coming years. North America leads the carbohydrases market due to the diverse industrial applications. The report also touches on various other important aspects of the market. It includes an analysis of the competitive landscape. In addition, the key players of this market have also been profiled.